Before he was discharged from the hospital, baby Gaël Villegas received the standard panel of newborn screenings to check for genetic and metabolic diseases and hearing. The results showed a healthy baby. Then, one more screening — a non-mandatory test that UCLA Mattel Children's Hospital routinely offers — was performed to check for critical congenital heart disease, or CCHD. The test, known as a pulse oximetry screening, detected a problem. 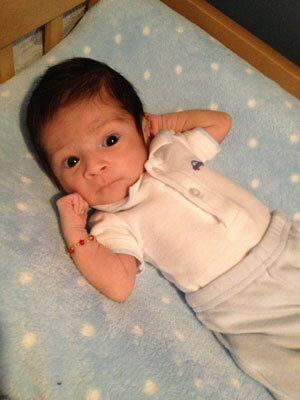 Baby Gaël was soon diagnosed with a condition that prevented his blood from flowing properly. At seven days old, he underwent a six-hour open-heart surgery with Dr. Hillel Laks, a professor of cardiothoracic surgery at UCLA, to repair the defect. Had it been left undetected and untreated, Gaël would have eventually ended up back in the hospital in serious condition. "Without the screening, we would have taken him home thinking that he was perfectly healthy," said Gaël's father, Davis Villegas. "When they did the test and told us about his heart condition it was hard news to get, but now we see that it was a blessing in disguise. It was better to know about the problem from the beginning so they could fix it." While UCLA has been performing pulse oximetry tests voluntarily for the past year as part of its overall program to provide the best methods for early detection and the prompt initiation of appropriate therapies for CCHD, recently passed legislation mandates that all babies born in California hospitals be screened for CCHD starting July 1. "This test is important because it enables us to discover critical congenital heart disease in some babies at a time when they are not yet showing any other signs or symptoms," said Dr. Jeffrey Smith, a professor of neonatology at UCLA Mattel Children's Hospital who oversees screenings in the newborn nursery at the hospital's Westwood campus. "If the problem is not detected before discharge from the hospital, these babies are at risk for rapidly becoming seriously ill or even dying at home. Early detection using pulse oximetry screening gives the baby the best chance for a good outcome." The simple, non-invasive, low-cost test takes only a few minutes to perform. A nurse attaches a probe to a baby's foot or hand with an adhesive wrap to estimate the percentage of hemoglobin that is saturated with oxygen. Low levels of oxygen can signal a potential problem. If a problem is detected, the infant is then given a diagnostic echocardiogram. Pulse oximetry screening does not detect all congenital heart diseases, so it is possible that a baby with a negative screening result may still have a problem. "As pediatric cardiologists, we see the devastating effect that delays in the diagnosis of congenital heart disease can have on these babies when they present later with problems that could have been prevented," said Dr. Mark Sklansky, a professor and chief of pediatric cardiology at UCLA. "Newborn pulse oximetry screening, along with the recent revision of prenatal ultrasound screenings to expand the routine evaluation of the unborn baby's heart, exemplifies how the field is recognizing the need to move toward earlier detection of heart defects. "Early detection provides the opportunity to plan ahead for appropriate delivery and immediate initiation of the appropriate management of the heart defect once the baby is born," he said. "For major forms of congenital heart disease, early detection facilitates optimal outcomes." Congenital heart disease represents the most common form of birth defect, as well as the leading cause of birth-defect related death. Congenital heart defects occur in one out of every 100 live births. Approximately 25 percent of these are classified as critical congenital heart defects, requiring intervention within the first weeks or months of life. Complex congenital heart defects can range from a hole between the chambers of the heart to the absence of one or more valves or chambers. "We are pleased that California is one of the nation's early adopters of this important screening, and we hope that all states will implement this test as a routine part of their neonatal screening programs," said Dr. Thomas Klitzner, the Jack H. Skirball Professor of Pediatrics and director of the Pediatric Medical Home Program at UCLA Mattel Children's Hospital. Klitzner participated on both the national and state task forces that developed the protocols for screening newborns for critical congenital heart disease using pulse oximetry.